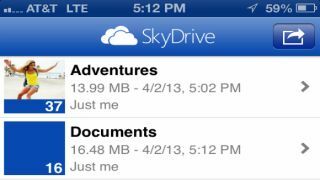 For the first time since last June, updates for Microsoft's cloud storage app SkyDrive are no longer blocked for iOS users. The battle over Microsoft's app has seen Apple stopping updates on the App Store since June 2012 but a truce has now been declared, with the service being brought up to the current version for iOS users. The 3.0 update, now available on the App Store, offers iPhone 5 and iPad Mini support. You'll also be able to download full resolution photos to said devices. We reported last year that Apple had demanded Microsoft pay a 30 per cent fee for customers purchasing additional storage through the app, which itself is free. The App Store guidelines dictate that Apple will receive 30 per cent of revenue from both app sales and in-app purchases. But Microsoft allegedly refused to submit, so Apple dropped the block bomb as punishment for not giving Cupertino a slice of the cloud-shaped pie. Microsoft is staying tight-lipped on the details, but told us: "Each app store has their own set of processes to decide what apps are approved and can be released. Earlier this week, Apple approved the SkyDrive app for release and we're excited to allow people everywhere to start using it." It also said that it has "nothing to share at this time" regarding updates for the Android app. Sorry, 'droiders.